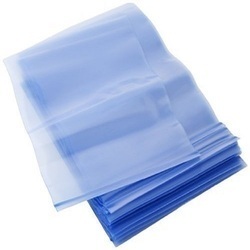 Providing you the best range of vci film, vci papers, vci shrink films and vci bags with effective & timely delivery. corrosion inhibiting chemicals. These chemicals are volatile, so they move from the VCI paper or film to the surface of the metal. These chemicals form a molecular layer of protection on the surface of the metal which will not allow rust or corrosion to take place. VCI products will provide complete protection for up to five years. We have a complete range of VCI products for long and short terms protection. VCI products should be used in any area in which corrosion or rust can occur. This includes in-process work, storage, in inventory, during shipment and during export. Unprotected metal may being to corrode immediately, so VCI protection should begins as quickly as possible. No, oils and greases are not necessary when using VCI products. Our range of VCI Shrink Films is precisely designed and developed. They are impeccable finished and requires low maintenance. This range of VCI Shrink Films is highly demanded in the market because of their salient attributes. We always pay attention towards maintaining the standard of our entire products range. This product is made at highly developed production unit by the use of superior quality of materials. They have been priced at very reasonable rates in the market. We have always given extra fine finishing to our final product range.